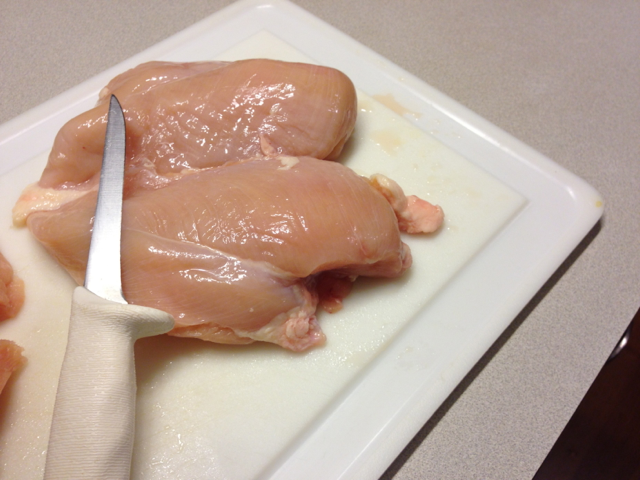 I pretty much only cut chicken twice a year. 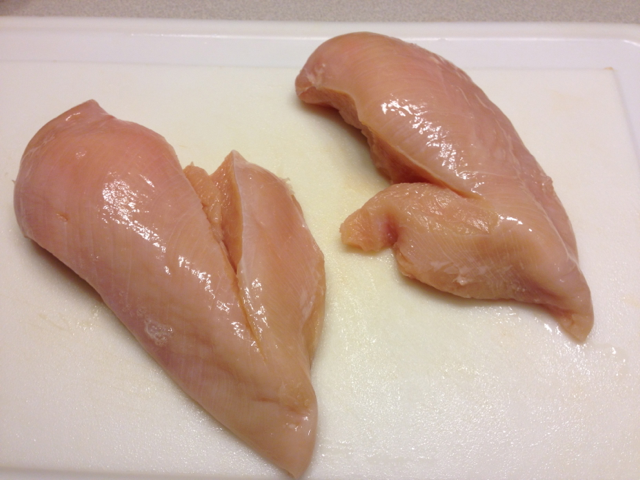 And I pay $1.89 per pound for 100 % natural chicken breasts with no added hormones, additives or artificial ingredients. Here he is with the child whose heart would break if I gave him away. He’s very pretty and not horribly behaved, I have to give credit where credit is due. But I digress. 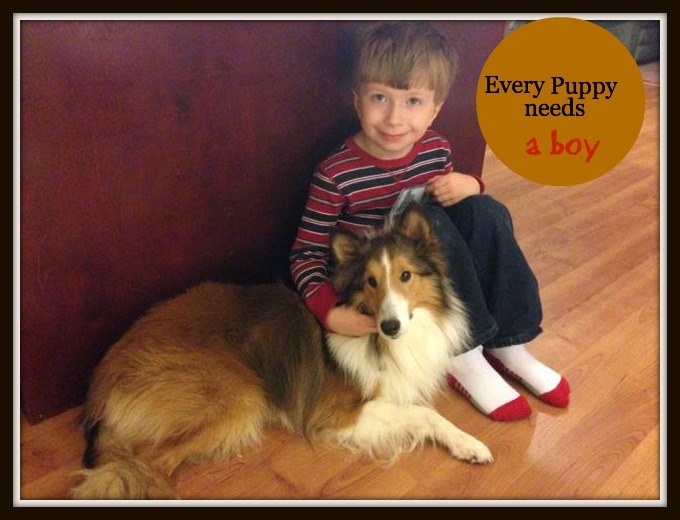 This is about chicken, not our hairy dog. 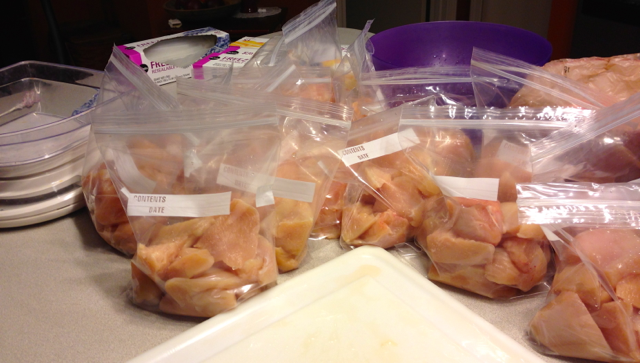 So, how do I get away with cutting chicken twice per year? I purchase it from Zaycon foods. You can learn all about Zaycon Foods here. I’ve ordered chicken from them a few times now, and I have an order of beef coming in a few weeks. I’m excited to be able to get all of my beef prepared and frozen, that will make meal time so much easier! I’ll write about that too, so you can see how I stock my freezer with recipe-ready ground beef. First; a note about healthy meat. If I had my preference, I’d order straight from a farmer who I personally know. The beef and the chicken would be pastured, raised without antibiotics or other chemicals, no grain, and processed humanely. Unfortunately I don’t have access to that kind of a situation right now. I’m in the process of looking, but finding something that meets those requirements and is affordable is not easy. In the mean time, I have to get as close as possible. I find Zaycon to be a good mix of quality and price. 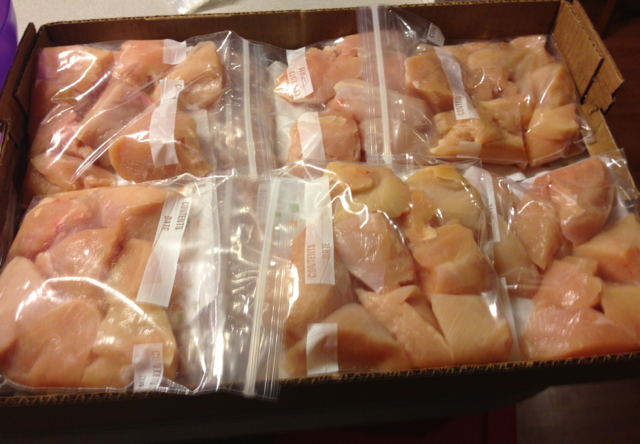 Okay, on to how I package 40 LBS of boneless chicken. First; start with an impeccably clean kitchen, shoes on your feet, a satisfied tummy, and gather your supplies. Two large bowls to work with. We’ll call them the huge bowl and the large bowl. One bowl lined with a grocery bag. That’s where you’ll put your scraps. When you’re done just tie it and throw it out. Here’s what it will look like when you open your box. 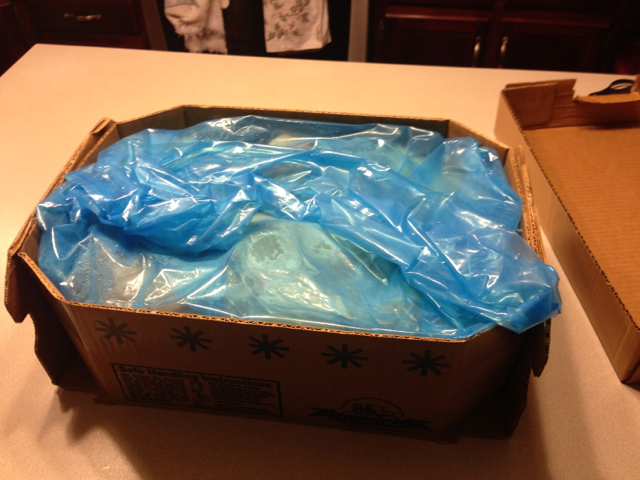 It’s hard to really tell in this picture but, once you open that one blue bag, you’ll see your chicken packaged into 4 individual bags; presumably with about 10 LBS in each bag. Set the whole box as close to the sink as you can get it. First, I go through and trim any fat off each piece in the bowl. (Ignore those pieces on the board. I have no idea what I was doing there.) Here’s how the logistics work. I take a piece from the huge bowl and trim it. That nicely trimmed piece goes into my large bowl. (After the photo I moved that other empty bowl to my right so I could take a piece, trim it, and drop it in the empty bowl without reaching back over the other one. And the scraps go into that red bowl in the background lined with with a grocery bag. Just keep doing that until it’s all trimmed. (From the one batch that just had a bath that is.) Your large bowl is now full of trimmed chicken and your huge bowl is empty. Now, give your huge bowl a rinse, you’re about to use it again. At this point, I decide if this batch is going to be strips or chunks. 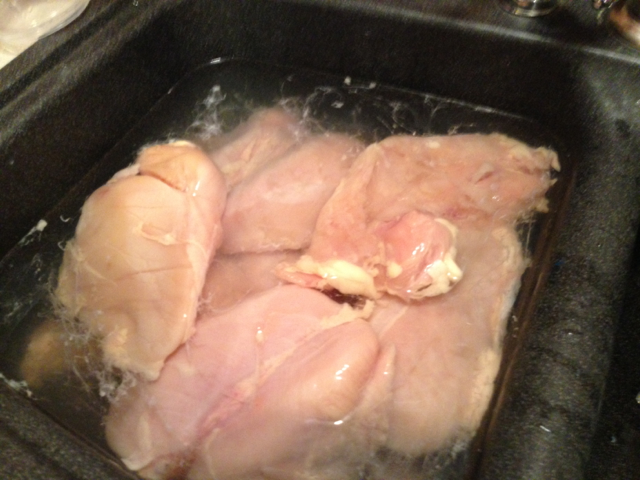 I use strips in things like fajitas, and chunks in things like Spanish chicken (recipes coming soon). Start cutting. Take a piece from the bowl, cut it to the size you prefer and throw it into your empty bowl. Now I Use a kitchen scale to measure (approximately) my chicken into meal-sized portions. I make mine about 1.25 pounds at the most. Open a bunch of bags while your hands are clean, then start measuring. Then wash your hands again and close the bags. I press mine out so the chicken is in a single layer. They fit better and defrost faster this way. Arrange them so they’ll fit into your freezer and get them in there right away. *Note: Always label anything you’re freezing. It’s amazing how different things look when frozen. The only reason mine isn’t labeled here is that the entire box they’re sitting is only holding chicken chunks. No strips, no fish, no cookie dough… you get the idea. **Another note. I usually put something like a napkin between the bags. If I don’t, the bags tend to freeze together a little bit. It’s not frozen solid but not something I want to deal with when I’m in a hurry to get dinner made. This whole process took me 2 hours, and that includes me not just washing my hands at every transition from one step to the other (like you’ll do) but also for ever picture! (And believe me, I took WAY more pics than you see here. I think I used a whole gallon of soap.) I misplaced the envelope on which I wrote how many meals I got, but I think it was around 30. You may be wondering how that lasts us half a year. Well, we also do pulled chicken for meals like chicken pie, soups, casseroles, enchiladas, etc. I do that from whole chickens, which I also do lots at a time because if there is something worse than dog hair, it’s pulling chicken off the bone. Hate that job. Always have. Always will. Might as well get it all done at once. I’ll come back and add a post about that the next time I do a big batch. And there you have it. 40 pounds of chicken, meal-ready in 2 hours. I think it’s a pretty good time-trade, not to mention the cost savings. Just another way we can “eat better and spend less”! Fill the clean sink with chicken, cover with cool water. 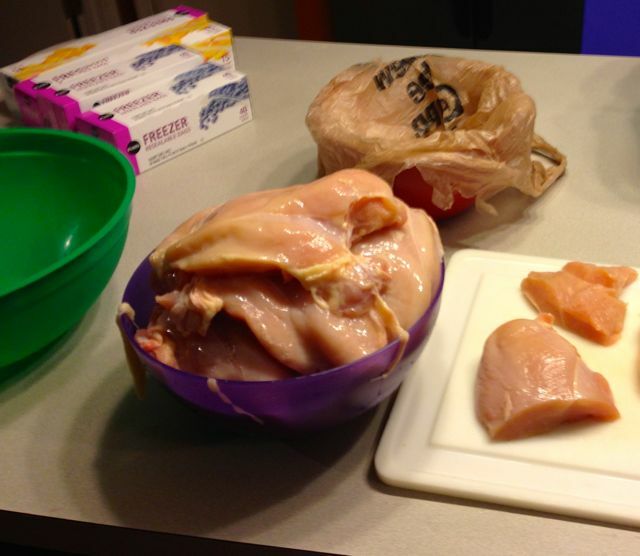 Transfer chicken from the sink to a large bowl. Trim fat of each piece, put cleaned piece into second bowl. Cut trimmed pieces to the sizes you want and place back into the first bowl, which is now empty and rinsed. Open lots of freezer bags, fill each with a meal-sized portion. 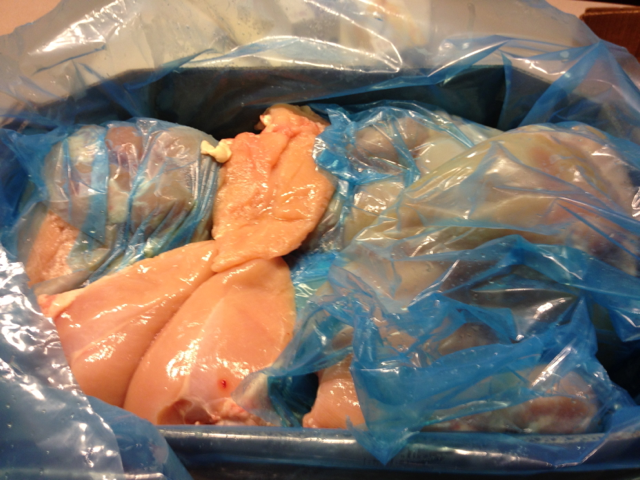 Arrange so chicken lays flat in the bags. Seal and label. Freeze right away. Can I ask how the beef order was? Did you like it and have you bought more through them? We liked it every bit as much as the grocery store’s version of “healthier meat” (whatever they call it) but honestly, not as well as the grass-fed beef we used to get straight from the farmer. But without that option, I’d way rather pay Zaycon’s prices for pretty high quality beef than what the grocery store charges. Hope that helps.